Wear + Tear: Lita is a rebel! Lita has come in so many different colours, textures, fabrications and forms - there doesn't seem to be an end to the craze! 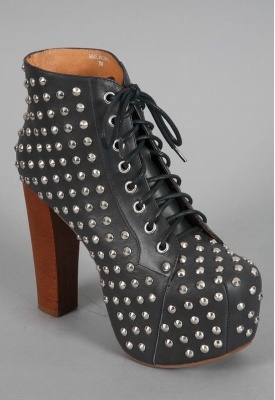 Just stumbled upon this studded Lita and boy am I in love. Alas I cannot justify having another pair of Litas when I have 4 new pairs of shoes from Solestruck working their way through customs as we speak, so I thought I'd just show you! If anyone buys these, I'd love to see a pic of them in action.